63 Days later takes place after the novel WILD. This can be read as a stand alone story. However, it might be more enjoyable if you read WILD first. Trigger Warning: Christmas music, trees, presents, and all around holiday cheer. 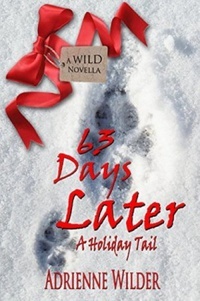 It’s been almost two years since Keegan and August escaped the Alaskan wilderness, and they finally get to celebrate their very first Christmas together. But their plans of peace and quiet get turned upside down when Santa leaves more than just presents under the tree.